Hello everyone! Yes yes I know, some of you may be thinking “pork belly for Christmas? You’re not doing a turkey?”. Let’s be honest guys, there are so many recipes for Christmas turkey out there and I just wanted to change things up a bit. However, I am not making a change just for the sake of it. When we think about pork belly, we think of a nice big juicy piece of meat, we think of crackling, plus this recipe involves a wicked gravy. There are the kinds of things that make a dish festive in my opinion, so for me, it makes sense to post this as a Christmas recipe. 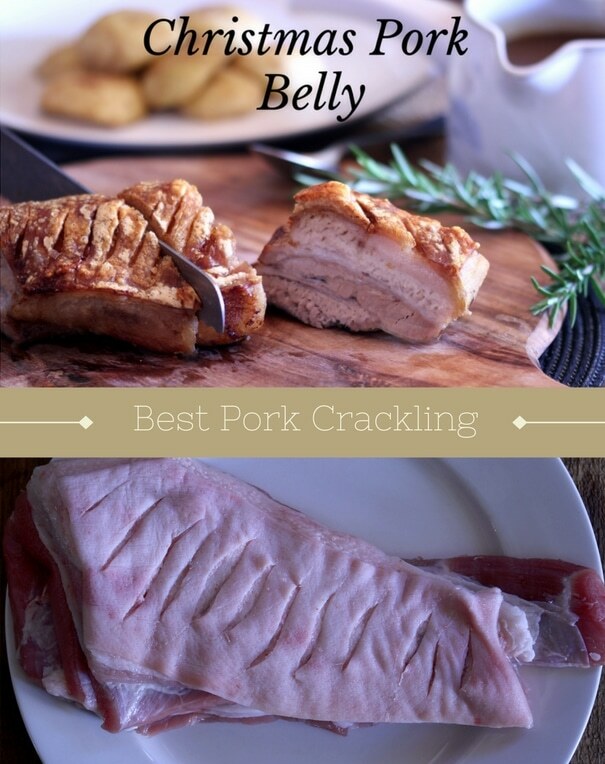 Also, pork belly is one of the cheaper cuts of meat, yet it is such it is such a great, reliable cut to use. 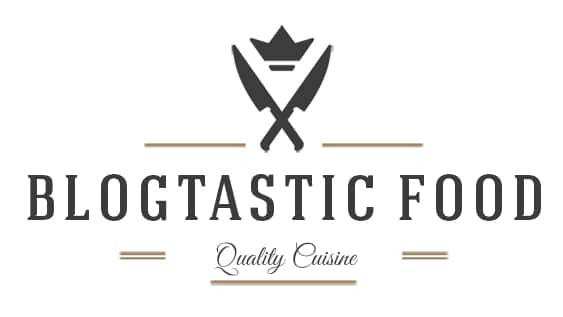 Reliable in the sense that it is easy to cook well. So if you’re tight on money this year but are still up for cooking this Christmas, pork belly may be something you want to consider. So since I brought up the subject of inspiring new ideas for Christmas, I was thinking, what about you guys? What would do differently or what uniqueness can you bring to the table on Christmas day? If there is anything like this you want to say then don’t be scared to leave it in the comment box below. Ok, guys thank you so much for reading this post I really appreciate every second you guys spend on this blog. I have a spiced apple Christmas recipe coming up very soon which goes really well with the pork belly. So keep an eye out for that, other than that I wish you all a lovely day, see you shortly. 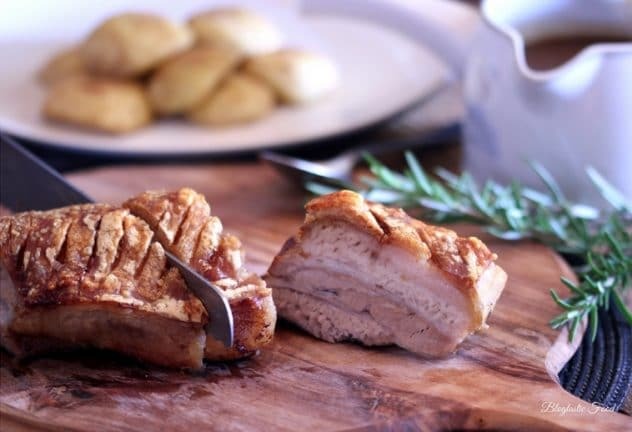 A festive pork belly recipe with an awesome crackling and a lovely gravy. Pre-heat your oven to 170 degrees Celsius. 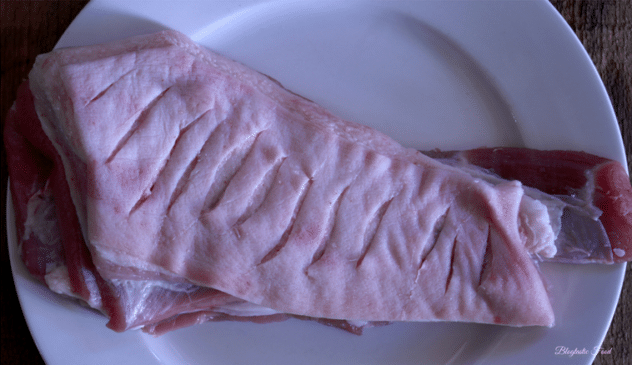 Score the fat on the top of the pork with a sharp knife or a stanley knife as shown in the picture above. Season the pork generously with salt all over, make sure you get the seasoning in the cracks of that scored fat. Get a large pan or a stainless steel roasting tray that can take the heat from a stove nice and hot on about medium-high flame. Add a touch of oil then add your pork fat side down. Sear that pork fat for about 3-4 minutes, turn the heat off then transfer the pork back on your chopping board. Add your onions, garlic, bay leaves and cloves to the pan and then bundle those ingredients together in the middle. This will just create a bed for the pork to sit on while roasting. So carefully place your pork on top of those bundled aromats in the pan. Finally, add a cup of water (250ml) in the pan (make sure you don't pour over the pork) to prevent any areas on the pan from burning. Roast that pork in the oven for 1 hr 45 mins - 2 hours. 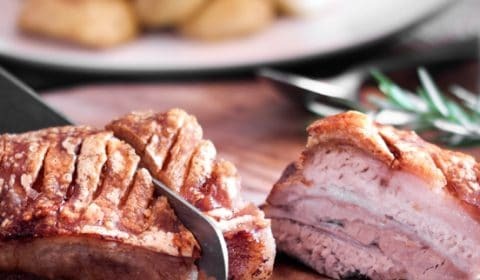 Take the pork out of the oven, increase the heat to 220 degrees Celsius, add another cup of water to the pan then place back in the oven for another 30 minutes to finish off that crackling. Once the pork belly is done, transfer to a board or platter, then cover with foil and leave the meat to rest. Also, make sure you put a folded tea-towl over the handle of the pan, this just reminds you that the pan is still hot and prevents you from burning yourself. Strain any of the juices from the pan into a bowl, make sure you push all of those juices through the sieve. If there is too much fat on top of those juices, use a ladle to skim it off. Add the cooked onions, garlic, bay leaves and cloves back into the pan, get the pan back on the heat and fry off those ingredients for 1-2 minutes. Add your apple cider vinegar and orange/clementine juice to deglaze the pan. Next, add your cornflour and stir through, then add 2 cups of water and those juices that you strained earlier. Bring that mixture to a boil then simmer for a few minutes. Season to taste with salt and pepper then strain one last time in a bowl. From there you can serve in a gravy jug or whatever you choose. Serve with the pork belly and enjoy. Scoring the fat on the pork belly will make your crackling crispier. Looks very tasty. Nothing like that crispy crackling. This sounds amazing perfect for a South African Christmas im definitely making this for the family !!!!! Awesome thanks so much! I hope you enjoy it! !